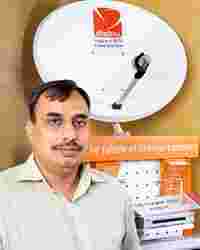 The country’s first private direct-to-home (DTH)—the technology that transmits television signals directly from the satellite to households)—service provider, Dish TV India Ltd, started operations in 2003 and it had no competition to speak of till last year. Yet, its financials look far from healthy. In the fiscal year ended March, the company recorded a net loss of Rs253 crore on net sales of Rs192 crore, and in the quarter ended June, its net loss was Rs89 crore on a net turnover of Rs89 crore.To make matters worse, Dish TV now has serious competition. Tata-Sky, the 80:20 joint venture between the Tata group and Rupert Murdoch’s broadcast network Star India, entered the DTH market with a bang last year, and last month, Chennai-based Sun TV also launched its service.At least two more players, and quite strong ones at that—Reliance-Anil Dhirubhai Ambani Group and Bharti Airtel Ltd—have also announced plans to enter the business. Two years ago, Dish TV’s marketing and advertising spend was around Rs14-15 crore. This year, you are reportedly spending close to Rs150 crore. What explains this more than 900% jump? My estimate is that marketing spends from the entire DTH category will go up to around Rs1,000 crore soon. DTH, in my understanding, will evolve the way mobile telephony did in the country. It was a new technology that promised people convenience and better services. Initially, it had only a handful players, but eventually, the market started getting crowded. But with that, the quality and affordability of the service has only improved. The expansion of mobile telephony has largely been pricing led. Are we going to see a price war in the DTH business as well? Should Sun TV’s Rs75 service be seen in that light? That (Sun TV’s offer) is a marketing plank. The Rs75 package they are offering only has regional channels. For consumers who want more than Tamil or other regional channels, there is no way you can provide the service at that price. A price war will be detrimental for the players. More than pricing, the challenge for DTH operators is to initiate conversion from regular cable and satellite services to DTH services, which is what we are trying to do. Pricing will play a role in enhancing this conversion, but more than that, it will be the quality and the convenience that comes with DTH services that will help in acquiring consumers. Both DishTV and Tata Sky have been showering freebies to push their services. Add to this the rising advertising costs and the pricing pressure. Is this leading DTH to the telecom dilemma of rising cost of acquiring consumers on the one hand, and declining Arpu (average revenue per user), on the other? The cost of acquiring consumers is likely to remain a challenge for the players for some time. It is...to be expected in any new business. But the potential for DTH to grow is huge, and it is growing quite fast. So, Arpu will only improve in the time to come. In our own case, for instance, we have added one million new consumers this year so far, on the 1.4 million base we had last year. At present, we are adding almost 100,000 consumers a month. And there are encouraging industry projections on the growth of the service. We hope to break even in the next three years. Looking back, do you think starting from cable-dark areas was a bad strategy? An urban entry, such as Tata Sky’s, would have helped bolster top and bottom line. When we started, we only had Zee channels. Other broadcasters were not there with us. Star channels, which at that time had a considerable consumer pull in urban markets, were not available on our platform. We, at the end of the day, are an entertainment company and if we can’t provide consumers the entertainment they want, then there is no point in going to them. That’s the reason we didn’t start with urban markets. In this situation, starting from non-cable markets was a good strategy because it was a virgin territory and the cost of acquiring new consumers in these markets was much lower. Today, DishTV is available in the remotest of areas... and so many consumers, who otherwise couldn’t see cable and satellite channels, are able to get good entertainment. There has been a huge debate in the industry on exclusivity of content. But you have been a strong opponent of it. Why? We are in this business to provide consumers good entertainment. Exclusivity goes against that principle. Exclusivity only helps operators and they are the ones who are pushing for it. Exclusive contracts with broadcasters will create unnecessary rivalry in the market. Operators with exclusive content will then start asking for a premium for their service, which will eventually hurt the consumer. According to me, the differentiator for an operator shouldn’t be the content but the quality of their service. Lastly, with convergence being the buzzword in the industry, don’t you think cable and IPTV’s triple play (Internet, telephone and television) will score over DTH in the long term? Indeed, other technologies, such as IPTV, and even cable, have an advantage over DTH in the sense that they can provide voice, Internet and television through one platform, but that doesn’t mean that DTH will eventually die. There will be room for all kinds of players in the market. DTH’s USP will be the quality of service and entertainment it provides. Besides, it is going to take us time before broadband becomes a mass reality for us. Till then, DTH has no threat from IPTV.